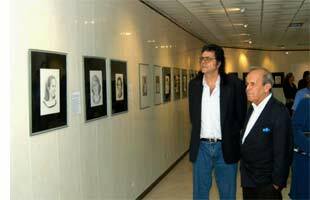 Havana, Jan 10 (acn) An exhibition of portraits of Cuban female patriots made by Antonio Guerrero, one of the five Cuban anti-terrorist fighters unjustly imprisoned in the United States, was inaugurated on Wednesday at the International Press Center in Havana. 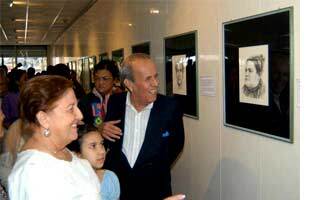 The exhibition, made with wax crayon on cards, consists of the portraits of 47 Cuban patriots that include Leonor Perez, mother of Cuban National Hero Jose Marti; Amalia Simoni, wife of Major General Ignacio Agramonte, who fought in the independence war against the Spanish colonial rule in the 19th century; and Vilma Espin, former President of the Cuban Women's Federation (FMC) who passed away in June 2006 in Havana. Precisely, this initiative by Antonio Guerrero is the first event organized by the FMC to commemorate the 50th anniversary of the Cuban Revolution and the 10th of the imprisonment of Guerrero, Gerardo Hernandez, Ramon Labañino, Fernando Gonzalez and Rene Gonzalez - internationally known as the Cuban Five. During the opening ceremony of the exhibition, Ricardo Alarcon, President of the Cuban National Assembly (Parliament), said that the values of the Cuban people, and particularly those of women, are reflected in the faces of these fighters and heroines who have been present in each of the stages of the national struggle for independence and for women's emancipation. Culture Minister Abel Prieto and Yolanda Ferrer, General Secretary of the FMC, attended the inauguration of the exhibition. Also present were Guerrero's mother, Mirtha Gonzalez; Rene's mother, Irma Sehwerert; and the wives of Ramon and Fernando, Elizabeth Palmeiro and Rosa Aurora Freijanes, respectively. Una muestra de retratos a creyón sobre cartulina, creados por Antonio Guerrero Rodríguez, uno de los Cinco antiterroristas cubanos, prisioneros políticos en cárceles de Estados Unidos, fue inaugurada la víspera en el Centro de Prensa Internacional. La exposición —a la que asistió una representación de los familiares de los Cinco— es un tributo al papel de las mujeres en la historia de la Patria y con ella la FMC inicia el año de actividades de la organización femenina en homenaje al aniversario 50 de la Revolución y por los 10 años del encarcelamiento de Fernando, Antonio, Gerardo, René y Ramón. Ricardo Alarcón, presidente del Parlamento, expresó que la expo es un merecido reconocimiento al rol desempeñado por las féminas cubanas en las luchas por la independencia. La muestra, en la que se presentan 47 imágenes, aprehende los rostros de Casiguaya, mujer india esposa del cacique Guamá; de Leonor Pérez, madre de José Martí, Héroe Nacional de Cuba, y de Amalia Simoni, esposa del Mayor General Ignacio Agramonte, y la heroína Vilma Espín, entre otras. Se encontraban presentes también Yolanda Ferrer, secretaria general de la FMC, y Abel Prieto, ministro de Cultura.